Digital Signal Processing means that traditionally, the signal has to be converted to digital and then converted back to analogue after the processing. 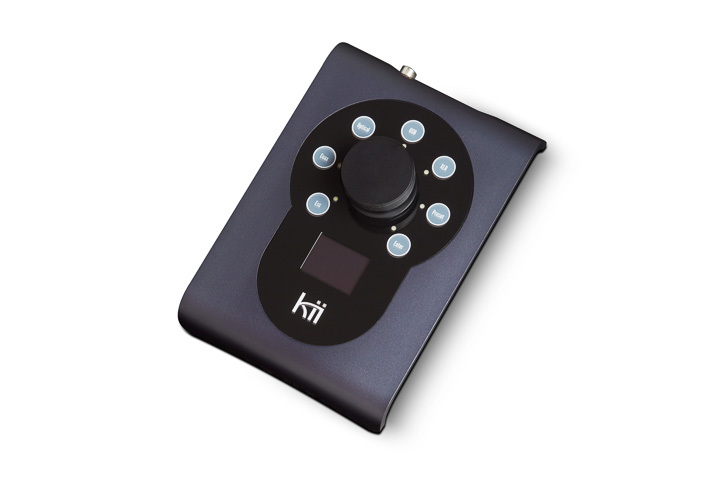 The Kii Three has six drivers, each of which has its own channel of DSP, D/A conversion, and amplification. That’s six 250 Watt NCore Class D power amps combining to produce 1,500 Watts, which is generous even for a professional monitor (there is a pro version of this speaker). The drive units they power consist of four 165mm bass units, a 127mm midrange and a 25mm wave-guided tweeter, but Kii won’t tell you, or me, what the cones and domes are made of. There are three basic ways to use the Kii Three: direct analogue connection via XLR from a preamplifier, direct digital with a USB to AES/EBU cable from a laptop with Audirvana or similar software that has volume control, or the most flexible approach, which involves something called a Kii Controller. There is a fourth option of direct digital connection via a Weiss INT203 which provides digital volume control but that is a niche within a niche. The Kii Controller connects to one speaker via RJ45 ethernet cable and the signal is passed to the second speaker with a similar cable. You can then use the Controller like a preamplifier for digital signals as it has optical, coaxial and USB inputs, it also has a knob for volume control, an IR receiver and a display where various parameters can be adjusted. These include boundary compensation across 12 settings for freestanding, against walls, and in corners. It also offers tilt style tone controls that allow subtle tailoring of the response to suit more or less reflective rooms. You can adjust latency, polarity, programme the presets on the Controller and adjust EQ for individual loudspeakers, which is useful if one has to be in a corner and the other has more space around it. Both speakers and Controller have coloured indicators to show status and these lights can be dimmed, and you can choose between auto standby or manual on/off for the system. Surprisingly the system incorporates a limiter to stop users damaging amps or drive units if the listener should get carried away or accidentally turn it up to 11 (or 99, which appears to be max output on the Controller), but in truth this is really for pro applications where some kind of visual indication might be handy for terminally deaf engineers! Kii offers a dedicated stand for the Three which is unusually chunky with two beefy columns that are mass damped yet also have cable management routing, they stand at a higher than average 67cm without spikes and provide a stable platform for the speaker. You can connect any analogue source to the XLR inputs and adjust level with the Controller, so with digital inputs going to the latter there is the potential for four inputs with the Kii Three. I started out by hooking up an Innuos Zenith SE server and AURALiC ARIES G2 network streamer to the USB input on the Controller, sending the signal over standard Ethernet cable to the speakers and powering them with Naim Powerline Lite mains cables. The resulting sound is a bit of a shock; the distributor told me to expect something a bit different and he was not wrong. This is because at low frequencies all loudspeakers interact with the room to some extent or another, the deeper the speaker goes the more this happens and ironically, the smaller the box the more bass comes out of the back and sides as a proportion of the total output. Take a large amount of that interaction out of the equation and you get a completely different sound that initially seems rather lean and lacking in low end waft, oomph, call it what you will. But after a while it becomes clear that the absence of this colouration allows significantly more detail to emerge from the speakers and you start to hear detail that eludes the vast majority of speaker/amp combinations. The resolution of voices, instruments and sounds of all stripes is quite uncanny.